A huge city with swarms of people, scooter exhaust and hissing cats, the urge to get away from Taipei isn’t hard to get. You’re in luck! 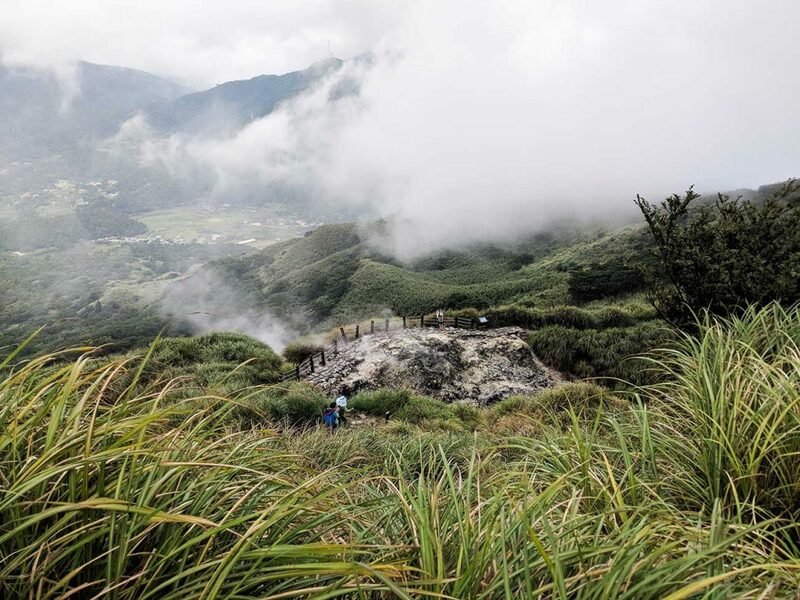 Yangmingshan National Park, only a 35-45 minute bus ride (NT$15 per passenger) from Jiantan MRT Station (S15 bus line), provides the nature and quiet one needs to escape from the hustle and bustle that is Taipei. Detailed directions below. 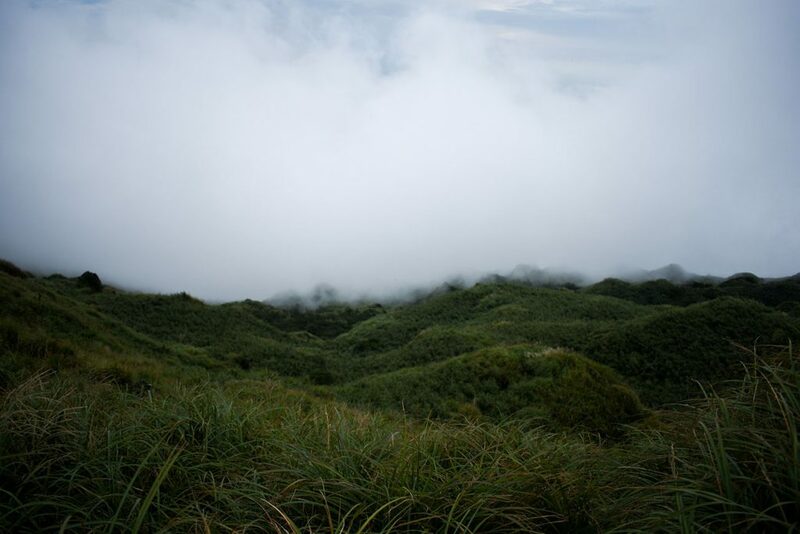 Make sure to start your day at the Yangmingshan National Park visitor center! It’s not far from the bus stop and the rangers there would love to help you! We arrived when the visitor center opened and the ranger was thrilled we came, giving us some awesome advice on how to experience the park and most importantly, a map! 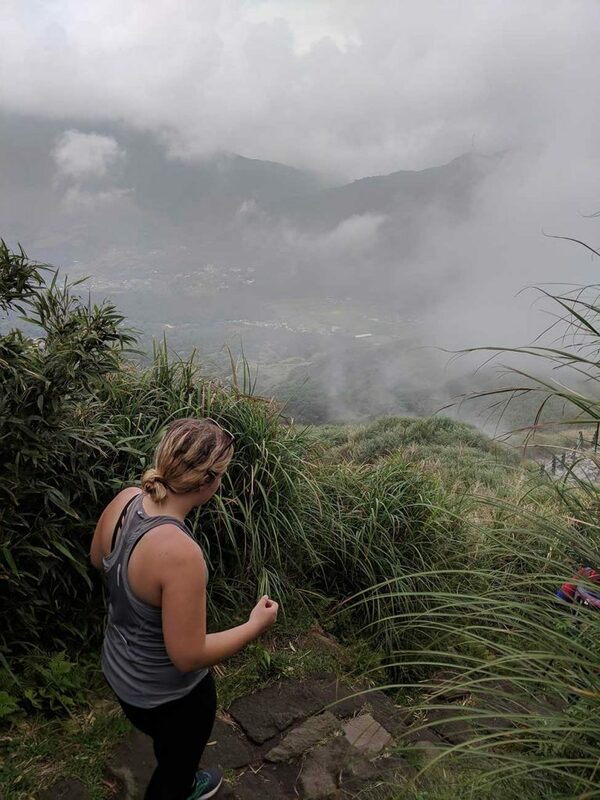 It would take multiple days to see all of Yangmingshan but we recommend starting with the Mt. Qixing hike. 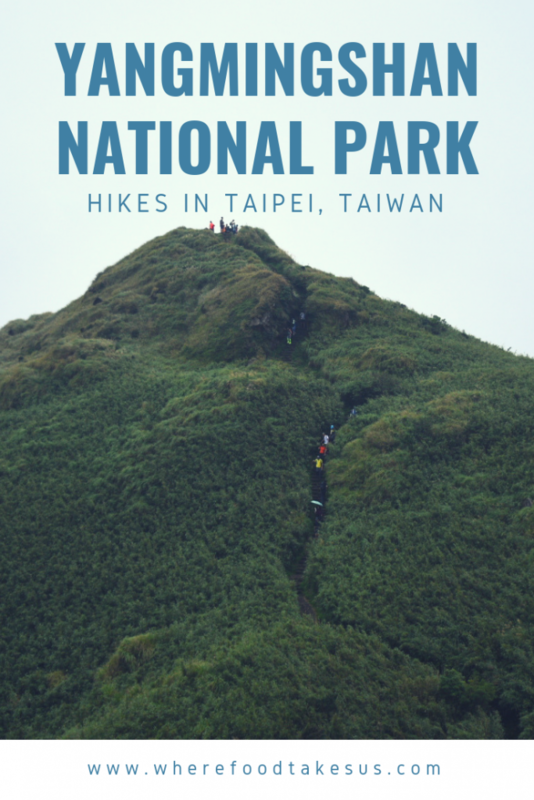 This hike is only about 2.4 km (1.5 mi) to the peak from the visitor center and then another 1.6 km (1.0 mi) down. Not a long hike by any means. HOWEVER! It’s straight up! The trail is all stairs so be prepared to feel the burn. 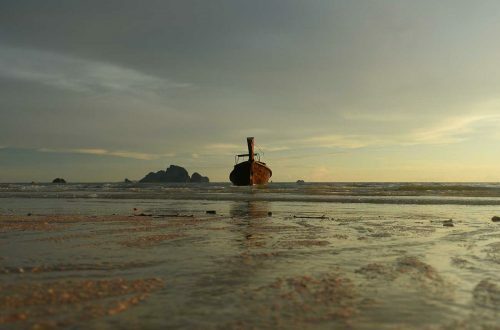 We feel sorry for whoever laid this path, though it is beautiful! We’ve done 10 hour day hikes that climb higher elevations, but Mt. Qixing took some serious effort! 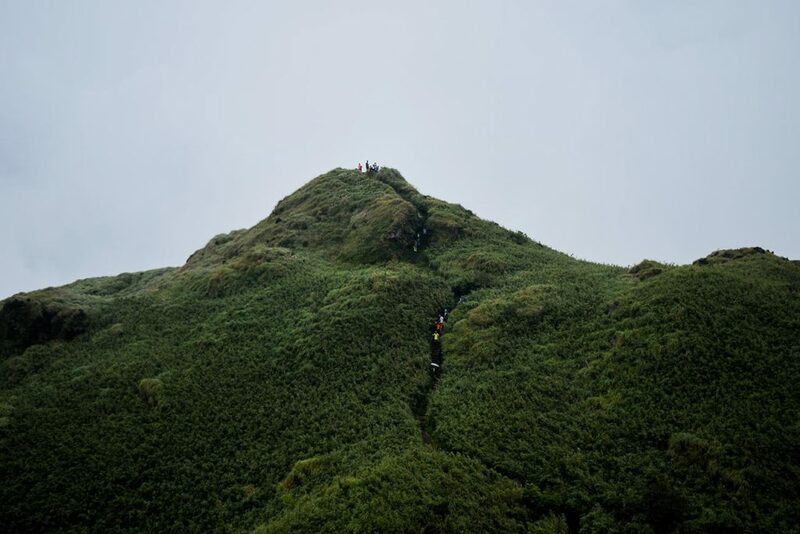 Add the steepness and Taiwan’s humidity and you’ve got a bit of a challenge. The burn was well worth the amazing views at the top. 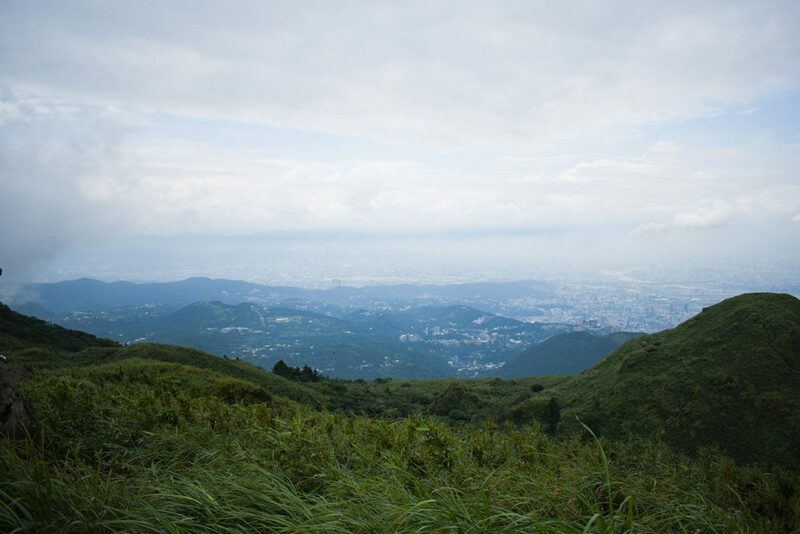 You can see Taipei from above and plenty of lush, rolling green that flows perfectly in the breeze. You can even catch a glimpse of Taipei 101 in the far distance (on a clear day). It was pretty overcast during our hike but the view is still great! On your way down you will pass sulfur deposits (this area was popular for sulfur mining in the old gunpowder trade), more lush green beauty and even more steep stairs so don’t go too fast! If hiking later in the morning or afternoon, be prepared for rain. We barely missed the downpour, as clouds came rolling over us while descending the peak after lunch time. If it does rain on your hike, the rocks can become very slippery so take care on those steep steps! Take bus S15 from Jiantan Station all the way to Yangmingshan station (by a 7 Eleven). 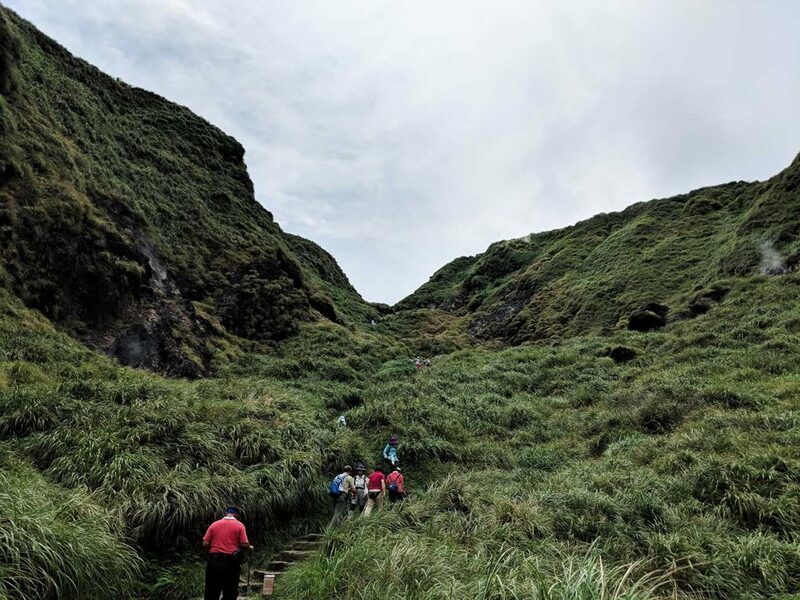 Follow the signs to the Yangmingshan National Park visitor center and pick up a map! Begin at Miaopu trailhead, hike to Mt. Qixing peak, and descend to Xiaoyoukeng visitor center on the other side. From there you can take bus 108 (this bus circles the park daily) and connect with bus s15 at Lengshuikeng, which will take you back to Jiantan Station MRT (Red Line). From there you’re on the ever so convenient MRT and good to go. It was pretty cool to literally be in the clouds! Wear good hiking shoes. Common sense, yes. But we saw so many Taiwanese wearing sandals. Some even hiked on their bare feet! Guess they’re used to it. Bring a snack for the peak! It’s a perfect spot to give your legs a rest and take in the views. Just make sure to take your trash with you! Bring plenty of water! We brought 4.5 liters total for both of us. Go on a weekday. We went on a Sunday morning, and it wasn’t terrible by any means but there are definitely a lot more city folk coming out to enjoy nature on the weekends. That morning we spotted a lot of people wearing hiking gear on the MRT on our way to Jiantan Station. The peak of Mt. Qixing was also a bit too crowded for our liking so we didn’t spend as much time as we wanted at the top. All in all, this was a beautiful hike, albeit a sweaty one! 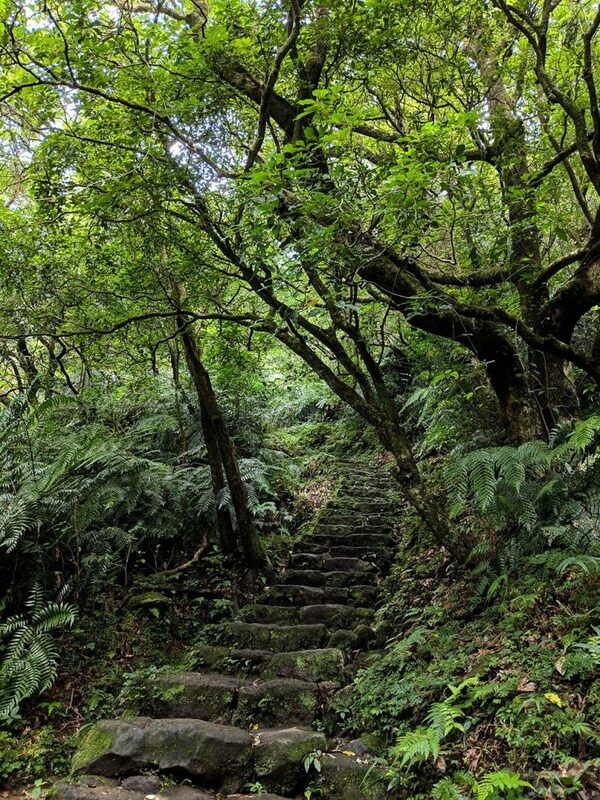 If you’re in Taipei and looking for a break from the city then give Yangmingshan National Park a go! Let us know what your toughest hike is below!